When sampling beer, there are a number of things to be on the watch out for. Much like wine tasting, there is a specific terminology which allows tasters to qualify and categorize what they are tasting with greater ease. Words like “malty” or “hoppy” are good examples, but in a lot of cases, comparisons to types of fruit, herbs, or even wood will be employed to characterize specific tastes. Also, certain varieties of beer tend to have the same characteristics which are similar across the board. But when it comes right down to it, a beer can be broken down into four basic categories, each of which is as important as the last. These include Appearance, Nose, Start and Finish. Appearance: The color and clarity of the beer. This can range from light or pale (which is generally a golden hue or light amber) to dark, which can be anywhere from a deep brown to the color of black coffee. In terms of clarity, a beer can range from transparent to cloudy and even completely opaque. This has much to do with filtration, but can also be the result of conditioning and the extent to which the barley was roasted. Whereas most modern lagers and ales are clear, “true ales” (i.e. traditional ones) are often cloudy and translucent, whereas stouts and porters are virtually impenetrable to light. *Case in point: try shining a light through a pint of Guinness. Odds are, you won’t see much coming through! Nose: This is the term used to describe smell. When you hold a glass of beer up to your nose and take a deep sniff, what do you notice? Does it smell floral? Bitter? Sweet? Does it remind you of baked bread or baked desserts? Perhaps you are noticing a theme here… What you must remember when sampling beer is that it is made primarily out of roasted grains, and the principle ingredient of these are carbohydrates. The result is a drink that will most likely have the aroma of something akin to bread, toast or pastry, depending on how roasted the grains were prior to malting and how long they were allowed to ferment. So words like doughy or toasty are neither inaccurate nor inappropriate. Then of course, there are the hops. By definition, hops are flowers, and have been used as a stabilizing agent and flavoring agent in beers since the 15th century. They smell and taste strong, and when roasted and added to beers, can release a variety of flavors. Different types of hops grown in different regions also accomplish different tastes when added to beer. More often than not, words like floral, citrusy and herbal are used to describe this, mainly because that is the closest known comparison. Start: This describes the taste you receive the second the beer hits your tongue. With all beer, this is when the malts and the hops deliver initial impressions, and the balancing act between the two is what defines the taste. For example, malts are what the drinker normally experiences first, but the hop profile may be discernible in this initial period of tasting as well. So pay close attention to what comes through in this time. For example, does the beer start off as smooth or bitter, sweet or tangy, smokey or subtle, light or heavy? Remember that this is all experienced in just the first few seconds; everything after this is appropriately known as the “aftertaste”. Finish: The finish, or aftertaste as already noted, is the lingering flavor that the beer leaves on the tongue. Ordinarily, this is accomplished by the hops, but a number of other flavors and notes are likely to come through in this time as well. For example, beers that possess any particular fruit, nut, chocolate or coffee notes will usually wait to the end to present them. Especially if these are characteristics derived from the hops and not the malts, but not always. In any case, beers usually have layers of flavor and it takes a few seconds or longer to fully appreciate them all. The ones that last particularly long are what are known as “lingering”. In addition, there are certain terms which the aspiring beer snob must be familiar with. Not only are these important for classifying and differentiating amongst the wide array of beers. They also help the drinker to know exactly what they are drinking, what went into making it, and can lead to a more rewarding drinking experience. Again, the terms can be broken down into four basic categories, which corresponds to the four basic ingredients (grains, hops, yeast and water) and are central to the smell, taste, and appearance of the beer. Malts: Malts are what occur when roasted barley or wheat (or any other type of grain like rice, emmer, sorghum or millet) are added to water and then boiled. The result is a denser, heavier liquid known as a wort, where carbohydrates are leached from the grain and then slowly ferment due to the addition – or the natural occurrence – of yeast. Depending on the “gravity” – how dense the malts are – and the degree to which the malts are roasted (made evident by the color) the taste can range from sweet to coarse, tawny to smooth. Hops: As already mentioned, these are the flower cluster that is used as a natural preservative and flavoring agent in beers. The addition of these flowers, once they are roasted, influences both the taste and smell of the beer. Depending on the types of hops used – English, German, Czech, East Coast, West Coast – the hop flavor can range from “dry” to bitter or citrusy to herbal. In terms of smell, what usually comes through is a sort of bitter-sweet, “floral” aroma (in the case of citrusy hops) or a dry, grainy scent in the case of English and Czech varieties. When the hops are added and whether or they are dried or fresh also has an influence on the taste, as attested to by “dry” and “wet” hopping. Dry hopping, which is the term used to describe adding dried hops after the wort is boiled, will enhance aroma but leaves a lighter, subtler taste – something which is common with ESB’s and many types of British Ale. Adding hops during the initial boil, which is standard in most North American beers, tends to bring out a more pronounced and strong flavor but a milder aroma. Wet hopping, on the other hand, described the use of fresh hops instead of dried ones, and tends to result in a smoother, subtler flavor. This process is rarer, but is gaining popularity thanks to the rise in craft brewing and the use of locally grown hop varieties. Yeast: In general, yeast strains fall into one of two categories: top-fermenting and bottom-fermenting. Top-fermenting yeasts have evolved from naturally occurring strains which occur when fermentation takes place at warm temperatures (i.e. 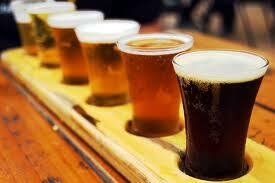 ales) whereas bottom-fermenting yeasts occur during cold-temperature fermentation to produce lagers. Thus the temperature at which fermentation occurs and the yeast involved has a great deal of influence on the taste, smell and even appearance of the beer. With the development of pasteurization and microbiology, beer makers have been able to develop their own yeast strains and experiment with them to produce specific varieties of beer. Minerals: Water is a key ingredient in beer, and depending on the type of water used, the flavor can vary considerably. In some cases, beer makers have chosen to use natural spring water, which is higher in mineral content that your average fresh water. The presence of these additional minerals will effect the finish of the beer, a quality which can only be described as “minerality”. In addition, brewers often prefer to use water from glacial springs or rivers to craft their beer, given that it is renowned for its purity and clean taste. This is especially true of brewers located in the American midwest, the Pacific Northwest, and the Canadian Rockies (BC and Alberta). Where can i find Gruit beers in Ontario? This is a very useful page. Always important to keep everything in mind when reviewing.